Clockwise: The author of Pitz Black, Mr. King Macachor, with Charge d’Affaires Emmanuel R. Fernandez; Spain-based Filipina singer, Ms. Manila Adap, who performed a song number during the program; a snapshot of some of the guests during the reception that followed; the author together with Madrid PE officers; and Mrs. Alma Origines Macachor reading an excerpt from her husband´s novel; Chargé d’Affaires Emmanuel R. Fernandez speaking about the need to provide the “missing pieces” in the image that Spaniards have formed about Filipinos in Spain. 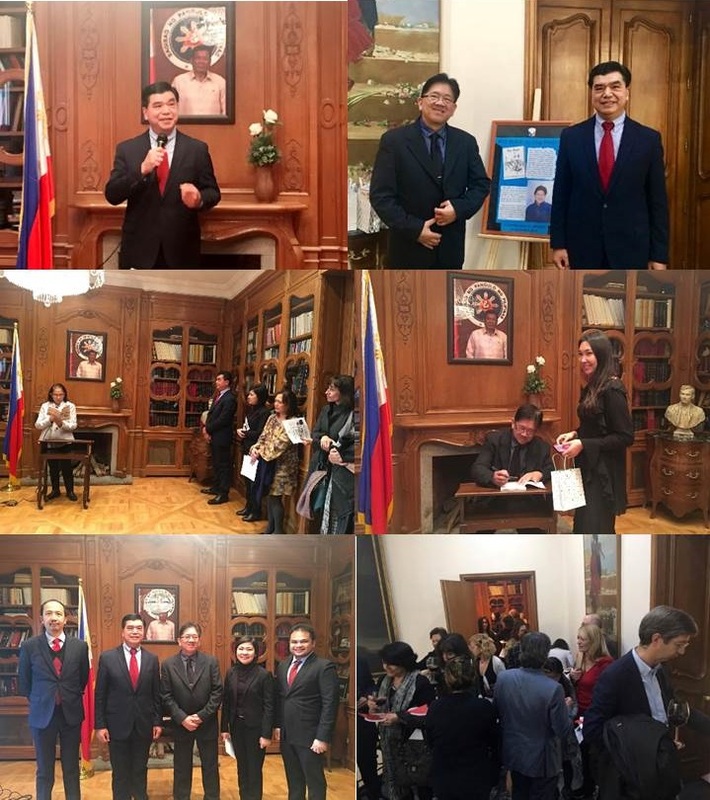 The Philippine Embassy in Madrid launched the book Pitz Black, the third and latest novel of Spain-based Filipino novelist, King Macachor, last 23 December 2016 at the Philippine Embassy Chancery. Mr. Macachor, who majored in English and took up law at the University of San Carlos, previously published two other novels (Sugbo and Whispers of the Raging Waters). He migrated to Spain in 1986 and has been living here since then. In his opening remarks, Charge d’Affaires Emmanuel R. Fernandez discussed the role that Filipinos like King Macachor play in the Embassy´s continuing efforts in the area of public diplomacy. He said that they help provide what he described as the “missing pieces” in the picture that many Spaniards have formed in their minds about Filipinos. He explained that while we Filipinos can take pride in the high regard that Spaniards have for our countrymen working in the domestic services sector, there is a need to make Spaniards realize that we Filipinos excel in many other fields besides that sector. We have world-class doctors, nurses, architects, engineers, computer experts, seamen, singers, musicians, performers, and writers who can be placed side by side with the world´s best. Unfortunately, CDA Fernandez lamented, not all Spaniards seem to be aware of this. This is the reason why, according to CDA Fernandez, the Embassy gives its full support for Filipinos whose work and accomplishments “help complete the inadequate picture that many Spaniards have of Filipinos in Spain.” He added that, in a similar fashion, the Embassy had given its support for the painting exhibit of Fr. Carlos Simbajon, O.P. (a Filipino Dominican priest who held a widely-acclaimed art exhibit in Avila last month) as well as the posthumous painting exhibit of Mr. Nicanor Hidalgo (a former Spanish-language scholar of the Instituto de Cooperacion Iberoamericana) last December 18. After the CDA´s opening remarks, Mr. Macachor´s daughter (Leane Victoria Macachor) introduced the author before the latter spoke. Mr. Macachor then narrated how he became a writer and talked about what motivated him to write. He recalled that his desire to write began with the desire to read a cupboard-full of Reader´s Digest issues that his uncle had forgotten in his basement. From then on, he fell in love with the English language – the language he uses to write his novels, as well as the language that he teaches to Spanish students in order to earn a living. The author´s wife, Mrs. Alma Origines Macachor, then read an excerpt from her husband´s new novel before the author formally presented a copy of the work to the Charge d’Affaires. A Spain-based Filipino singer (Ms. Manila Adap) then sang “Somewhere Over the Rainbow” before the crowd dispersed for the book-signing and reception. Over forty guests attended the book launch, including members of the Filipino community, Spanish educators and entrepreneurs, Embassy personnel and family members of Mr Macachor.